I want to thank my pattern testers. Without their input this pattern wouldn't have been born. Mary from Las Vegas crocheted the two in the same photo. Jo from NY crocheted the blue one. There are patterns for three sizes of containers included here. You can easily modify the pattern to whatever plastic container you have around. The one with the pink centered daffodils is made for a small Cool Whip Container. The one in the same photo with the yellow centered daffodils is made for a GladWare quart container. The pink one is on a small sized basket. 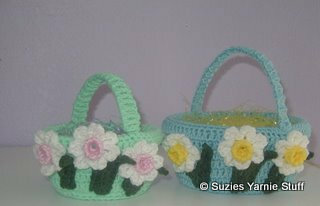 The blue one is on the large sized basket. 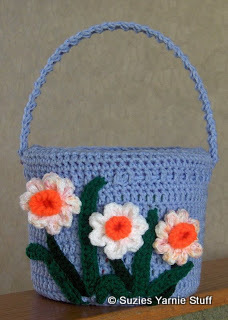 To modify the pattern just crochet the base to fit your container, then work the sides even until it reaches the rim of the container. Then follow the pattern instructions to finish. The handles on the both the Cool Whip and the GladWare ones were made with a strip of plastic canvass for stiffening. 2. Pull your slipstitches tight. 3. Before beginning remove handle from bucket. Save it, as you will need it to finish the Easter Basket. Compare to bottom of the container you are using. Piece should be about the same size as container bottom or slightly smaller. Fit over container, spaces in round 13 should be over where the handle attaches. Tie: Chain 75. Fasten off. Using yarn needle and tail weave in and out of Round 17. Pull snug and tie in knot or bow. Handle: Ch 3, yo insert hook in first ch, yo and pull loop through, yo and pull though 1 loop (this creates the base ch you will go into on the next st), yo pull through 2 loops, yo pull through 2 loops. *Yo insert hook in base ch, yo and pull loop through, yo and pull though 1 loop, yo pull through 2 loops, yo pull through 2 loops. Repeat from * until piece is as long as the handle, with a odd number of bars. Weave the basket handle in and out of the bars. Reattach handle to basket and tack the first and last bar to the basket cover. Fit over container, spaces in round 17 should be over where the handle attaches. Tie: Chain 125. Fasten off. Using yarn needle and tail weave in and out of Round 21. Pull snug and tie in knot or bow. Fasten off, leaving a tail for sewing.Weave the basket handle in and out of the bars. Reattach handle to basket and tack the first and last bar to the basket cover. Additional materials:Strip of plastic canvass for handle, approximately 3/8 inch wide and 12 inches long. Fasten off and weave in ends. Fit over container. Tie: Chain 65. Fasten off. Using yarn needle and tail weave in and out of Round 11. Pull snug and tie in knot or bow. Weave the basket handle in and out of the bars. Attach handle to basket by sewing the handle covering to the basket cover on opposite sides. Other suggestions for embellishments are ribbons, buttons and silk flowers. i have made a similar basket using the plastic ice cream containers with the handles on the them. i crochet ears and run pipe cleaners through them then glue them on the front of the basket, i use the squiggley eyes and a pom pom for the nose and pipe cleaners for whiskers and felt for the mouth. Thank you so much for you'r generosity. Yor ideas are so clever.